Dr. Jess Leasure is board certified by the American College of Veterinary Surgeons. She graduated with a BA degree in biology from Mt. Holyoke College and a BVMS degree from the University of Glasgow’s Faculty of Veterinary Medicine. Following graduation, Dr. Leasure completed an internship in small animal medicine and surgery at the University of Wisconsin-Madison; a surgical internship at WestVet Animal Emergency and Specialty Center in Boise, Idaho; and an internship in orthopedic surgery and sports medicine at the Veterinary Orthopedic and Sport Medicine Group (VOSM) in Annapolis Junction, Maryland. 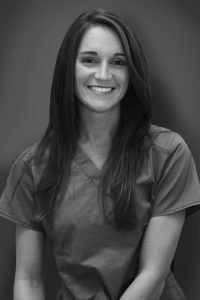 She then went on to complete her surgical residency at Affiliated Veterinary Specialists in Maitland, Florida. Dr. Leasure recently returned to Maryland to join the surgery team at Skylos Sports Medicine. Dr. Leasure is very passionate about minimally-invasive orthopedic surgery and orthopedic oncology. An additional interest in improving the management of end-stage osteoarthritis keeps her current with research into joint replacement techniques as well as alternative treatment solutions. She has co-authored a chapter in the second edition of Tobias and Johnston’s Veterinary Surgery: Small Animal and, most recently, published a peer-reviewed article focusing on total hip replacement. Dr. Leasure is as enthusiastic about teaching as she is about learning. She provides surgical instruction to veterinarians as a continuing education/laboratory lecturer, and brings that experience to each of her clients—both during and after consultation. Dr. Leasure appreciates that no two families are alike, and enjoys the challenge of tailor-making treatment plans to address individual patient needs. She truly believes that the best outcomes are achieved through compassion and a thorough understanding of the underlying condition. By actively engaging each family in the entire treatment process, Dr. Leasure hopes to create a positive experience for everyone. Now that they are all together again in Maryland, Dr. Leasure enjoys spending as much time as possible on Chesapeake Bay with her own family–husband Chris, also a veterinarian, and their two dogs: a Border Terrier named Hudson and a rescue named Georgia. In the summer months, Dr. Leasure enjoys boating and rooting for the Orioles at Camden yards, while the winter is all about the Capitals. Year-round, Dr. Leasure is a veteran traveler, and an avid foodie. A consultation can be scheduled with one of our client service coordinators by clicking the button below or by calling 410-465-2428. Peri LOVES her PT sessions with Dr. Faith at Skylos. Though she’s usually very nervous at the vets office, Dr. Lotsikas has a gentle manner that puts Peri completely at ease. Can’t say enough good things about Dr. Faith and Dr. Peter and their staff.